Welcome to Aulani, A Disney Resort & Spa in Ko Olina, Hawaii, Overlooking Kohola Lagoon, this beachfront Disney resort is 5.4 miles from Highway 1. Save 30% on 5-Night Stays! Set ocean-side along a tranquil lagoon on the island of Oahu, the Resort was created with families in mind, by the people who know families best: Disney.With incredible pools, an unforgettable, complimentary kids’ club and world- class entertainment, Aulani Resort is a whole new world, indeed. Now through September 26, 2016 save 30% on stays of 5+ nights when you book select nights between August 21 through December 19, 2016. And save 25% on 4-night consecutive stays. Book before June 27, 2016 and you’ll also receive a $150 USD Resort credit. Plus: Book a room with a premium view (partial ocean view or ocean view) and receive 1 meal per person per night at the Ulu Café. 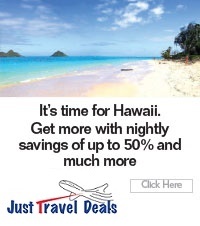 Dynamic pricing includes hotel accommodation and round trip airfare to Honolulu.